← Out With a BOO! With the Dredge and the Gate all closed up for the season, the park looks like it’s nestled in ready for a long winter nap and dreams of next summer. "Dreaming of sugar-plums and gold pans"
But with great snow comes great snow shoeing! As the clouds pile it on, soon trails will be seen winding through the park as the snowshoers climb out from the cozy in their cabins and explore this winter wonderland. 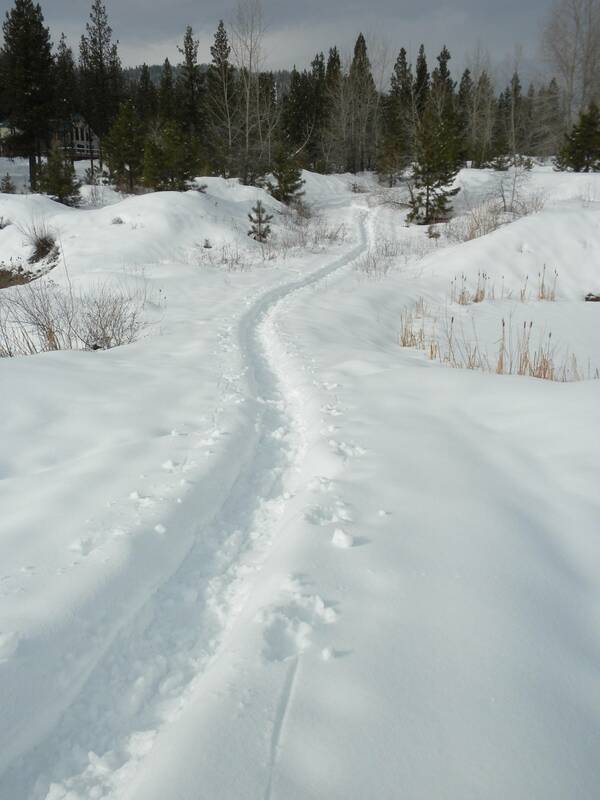 The Tracks of a Great Elkhorn Snowshoer! 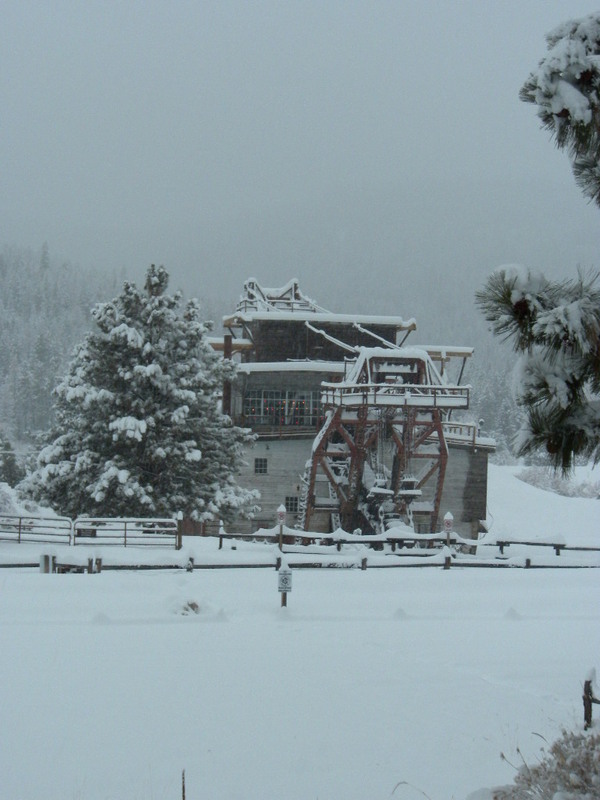 Grab your snowshoes and bundle up warm to see what is happening in the park during the winter. This is a great time to look for animal tracks, take pictures, and just get out and play in the snow and see parts of the park not always accessible in the summer! Dress warm: Layers are best because you don’t want to get too hot while you’re hiking but you also want to stay warm when the temperature drops. Stay on the trail. Always stick to premade snowshoe trails. The snow hides many treasures but also many dangers. There are drop offs, ponds, and other things unseen. Be wary of river crossing. Crossing the river might look tempting if it is iced over, but looks can be deceiving. The depth of the ice might look thick closer to the bank, but be thin in the middle. If you don’t know, then don’t go! Know the weather. Storms or temperature changes can come in quickly. You don’t want to be caught away from your fire when that happens. Keep an abundant supply of hot chocolate. This is especially important! Park staff and volunteers will also be leading guided snowshoe tours over the winter. Stay tuned for the dates. Looking forward to seeing you as we’re walking in a winter wonderland! This entry was posted in Snowshoeing, Winter Updates and tagged Snow, Snow Shoeing, Snow Update, Winter. Bookmark the permalink.